Conferences: knowledge exchange of the past or for the future? As I write this, I’m preparing for my second Transportation Research Board Annual Meeting in Washington, DC. The 11,000+ attendee conference takes place January 22-26, and covers all topics related to transportation planning, policy, and engineering and related topics like health and land use planning. The preparation work got me thinking: a conference this big is a wonderful opportunity, and at the same time it’s also a burden. In order to get the most out of it, that is, in order to catch a raft on the river of information exchange, one must do a lot of prep work – who’s going to be there? Who should I see? What topics are being covered? What topics overlap with my current projects? And then, one actually has to go there and see those people and talk to them in person. It got me thinking. This type of information exchange seems a bit antiquated. Or is it? Today, we have tools like Twitter, Facebook, LinkedIn, and even simple email that allow rapid communication without physical proximity. Individuals are putting together knowledge share events, where subject “experts” educate their friends in a fun, relaxed, and community setting, negating the need to rely on a large centralized entity to plan the exchange event. Do these things better facilitate information exchange than the traditional conference? Judging by the popularity of the “unconference,” perhaps a hybrid model is appropriate. One thing we know for sure: collaboration is the new black. Whether it’s through bike sharing, car sharing, crowd sourcing, or peer-to-peer anything, the 2010s are all about collaboration. What traditional conferences do is exemplify how Richard Florida’s creative class flourishes in Edward Glaeser’s agglomeration economies: bring smart, motivated, interesting people in close proximity with one another and they’ll start collaborating. This collaboration is at the heart of innovation. But again, are traditional conferences the best vehicle for delivering this collaboration, if attendees are meant to shuffle themselves into pre-assigned sessions with pre-assigned topics, hour after hour, day after day? Would smaller, collaboratively-led “unconferences” be a better answer? Would more or better information be exchanged in these settings? Maybe the success of a conference as large at TRB actually is due to its sheer size: the conference itself is a city of the creative class, rubbing shoulders with one another. What a world we live in. We’ve created all this technology to observe the city, and yet it is us who are observed. Entire cities are being constructed on the premise of observation – an idea that with systematic data collection, we can tease out the important information to make our cities run more efficiently and our lives more convenient. But what exactly is that data? It’s not the city’s data so much as it is our own. Not the efficiency of the pipes but how much water we use. Not the congestion on the streets but how much we drive. The sensors of “smart” cities are like the computers in our cars: sensors designed to measure, in real time, everything that comes in and goes out of the system. And ultimately it is us who are responsible for the myriad inflows and outflows. Of course, smarter cities have the potential to increase dramatically our level of understanding of human interaction and production. There are huge benefits, no doubt. And at the same time, an opinion piece in the New York Times this morning reminds us that temporarily pulling away from the vast array of information available to us today is perhaps the most essential of actions to processing it. As we head into 2012, I’m reminding myself of the importance of balance. As we speed forward toward smart and connected cities as a civilization, individually we must take rest stops on the information superhighway – lest we mistake the data trees for the information forest. The information that truly brings efficiency and convenience to our lives. We talk a lot about Government 2.0 and the infusion of communications technologies into public services on this blog. As written about before, public services are, in many cases, location-based and require spatial understanding to be implemented efficiently. Students at the Oslo School of Architecture and Design have developed a technology that ties these two ideas together (video below). Using simple flashing lights and long-exposure photography, the team literally mapped WiFi signals throughout Oslo. The resulting 2-D patterns (planes made of small blue-glowing dashes) serve as an almost eerie reminder of our “2.0” world. It would be really interesting to see these WiFi topography maps developed for particular socio-demographic sectors of the city, as well as 3-D maps composed of several of the 2-D topographies. [youtube http://www.youtube.com/watch?v=EtpNx7Y14d0&w=440&h=278] Layar is a mobile phone app-developing company based in Amsterdam. The premise of their app, also called Layar, is augmented reality. They’ve received two funding rounds so far for a total of €13.4 million with partial financial support from Intel Capital. They were highlighted at Google Zeitgeist, named a 2011 Technology Pioneer by the World Economic Forum and TIME Magazine. They won the title “Disruptive Innovatorat” at the 2010 Deloitte Fast50 and won Grand Prix 2010 at Netexplorateur. Needless to say, if they’re not big now, big names think they’ll be big in the future. In its current state, it feels like a fun toy, but I think it has the potential to be quite a game changer. I’ve used it to check out crime in my area with SpotCrime. From anywhere, I turn on the app and point my camera outward and Layar displays crime icons over the backdrop of my actual surroundings. It’s really powerful, and that’s just the tip of the iceberg. It’s essentially a platform for all spatial data, and we’re not just talking about shapefiles for a static GIS. These data are real time, often created by you or your friends (e.g. Yelp, Flickr, Foursquare) or even by the local government (e.g. PlanningAlerts). Use of Layar has the potential to engage more citizens more actively in their local surroundings. It can help planners translate development proposals into real images that citizens can see while walking down the street. It can enhance impact assessment, where developers, city officials, planners, and citizens can visualize what facilitating automobile use will do to congestion and to the public realm. Check it out and see what you think it can do for you. [youtube http://www.youtube.com/watch?v=qkceyKlYrJo&w=440&h=278] I was surprised when I realized I hadn’t yet blogged about Code for America. I mentioned it in a post last week about the future of technology and planning, and then came across it again reading Arc User: The Magazine for ESRI Software Users. For those unfamiliar, ESRI is the company that produces the most widely-used GIS software – ArcMAP. Turns out they’re also advising the Code for America program. So, what is Code for America (CfA)? They’re a new non-profit that teams with cities, figures out a challenge the city is facing that could be solved most cost-effectively with a tech/web 2.0 solution, and recruits technologist fellows to spend about 10 months working out the solutions. The result is that cities get their problems solved cheaper (and faster) than doing it on their own and the technologists get to do good while doing what they love. This round, CfA has partnered with Boston, Seattle, Philadelphia, and Washington DC. The intent is that they’ll solve each city’s challenge in an open and transferable way, creating solutions that apply to any municipality in the US. Boston has challenged the fellows to improve high school education through an engaging web platform; Seattle is looking for a mechanism to enable more fluid collaboration between and among communities and public safety officials; Washington DC is expanding upon its own Apps for Democracy project, creating a manual to assist other governments in their open data programs; and, Philadelphia has asked for a solution to allow citizen collaboration on neighborhood services. CfA is currently in full swing, with all fellows working together out of San Francisco. We should expect the first round of solutions in September with a hand-off to cities in October and November. In the meantime, they’re already recruiting for the next team of technologist. Act fast because the early deadline has already passed! Since our call for contributions in February we have received a great response and have now completed the new guidebook for small- and medium-sized businesses on the new markets emerging around social, green, innovative and electronic public procurement together with ACC10, the Catalan Competitiveness Agency and the euroPROC consortium. The English edition of the guidebook is to be launched at a conference in Barcelona in June 2011, but participants of our Summit on Service Innovation in Cities on May 12 2011 will receive advance copies hot of the press. It is expected to be translated into 10 languages over the coming months. With over 25 contributors such as leading policy makers in the UK Government's sustainable and open data programmes; Business leaders such as Oracle's Global Senior VP for Public Sector, Education and Health; and 16 case studies of small businesses using innovative, green or socially responsible procurement measuress to open new markets. We worked closely with Base Design to deliver a stunning visual approach to the complex themes that should inspire business leaders to enter a market valued at 16% of world GDP. I’ve just spent twenty minutes watching two fantastic videos covering issues of cities, of technology, of human progress and success, and of the path forward. I follow TedTalks on Facebook. Today, they posted a 15 minute clip of Lisa Gansky, author of a new book called The Mesh. The “mesh,” according to Gansky, is “a new way of doing business” – it represents a paradigm shift in business opportunity. As Gansky notes, the latest communications technologies are encouraging businesses to be more integrated with their consumers. Consumers are even more integrated with each other. Examples in transportation include ZipCar, RelayRides, Facebook, and Capital Bikeshare, but the trend is even more widespread into areas such as recycling, farming, community and government, and energy. She argues that ventures who ignore these trends are undermining business, as well as societal, interests – a powerful shift indeed. In a separate video, John Stewart interviews Harvard economist Edward Glaeser, who has recently published a new book as well, Triumph of the City: How Our Greatest Invention Makes us Richer, Smarter, Greener, Healthier, and Happier. Glaeser laments that anti-urban policy is still so prevalent in the US (for instance, policies that encourage buying homes in suburbs and driving cars on over-provided highways). He claims that two-thirds of the stimulus funds went to our least dense places, leaving one-third for our most-dense, most-populated areas. These policies are undermining our ability to progress; anti-urban policy promotes low-return investments. It is the cities that make us richer, smarter, greener, healthier, and happier. Why would we invest anywhere else? I thought the two tied together nicely, pointing out not only economic but also social justifications for living, working, and sharing in closer proximity than we may ever have here in the US. Now that these benefits have been established, perhaps individual behavior change will follow the lead of start-ups and government funding decisions in order to create more efficient, clean, productive, and livable places. Living Labs Global has been invited by euroPROC, a European Consortium gathering 10 European Regions (funded by European Regional Development Funds - Interreg IVC), to author & edit a guidebook for small- and medium-sized businesses on the business opportunities and strategic issues around new trends in Public Procurement. The Guidebook is to be published in digital and paper form in June 2011 and will be a highly relevant document for companies across the EU and beyond interested in entering and navigating new markets with innovative solutions. Public Procurement in the EU amounts to 16% of GDP, or EUR 1,889,394,720,000, and constitutes a significant market for innovative services and products, especially if procurement policies are clearly designed to consider sustainability and innovation measures. In Europe as in other global regions like the US and China, innovation in public procurement is supported by active policies to stimulate uptake of new technologies, higher quality services at reduced costs, and environmental and social impacts. Mechanisms that can unfold innovation, such as pre-commercial procurement or applying green measures to procurement are rarely understood by smaller businesses, that could benefit most from new processes. We are issuing this call for contributions to make sure the Guidebook reflects the best possible insights from both government agencies (national, regional, local); businesses and professional expertise. Already high-profile government and business leaders have pledged their interest and availability. Like our "Connected Cities: Your 256 Billion Euro Dividend" Handbook on Service Innovation in Cities, the new guidebook will apply a combination of highest quality design provided by Barcelona's Base Design with our insights into the issues that press SME's in entering public procurement markets with innovative products. We are aiming to provide our community with a valuable tool to assure that their innovations reach new markets. If you are interested in making a contribution through pointing us to interesting cases, statistics, failures or success stories; share your opinion; or provide access to references please do not hesitate to contact me to discuss details or reply to this post. We are committed to credit contributors, but respect also the interest by individuals to remain anonymous. Contributors will be invited to review the draft of chapters in the beginning of March 2011. An interesting study was just released in Wisconsin that estimates the value, in dollars, of bicycling in the state. Skimming it brought to mind Living Labs Global’s own study, Connected Cities, which quantifies the opportunity, in euros, created by mobile technologies and the need for innovation in city services. In both cases, a strong set of localized or specific base data are synthesized and estimates are extrapolated from there. In the case of the Wisconsin study, authors from the Nelson Institute for Environmental Studies focus on recreational, long distance, and predominantly non-resident cycling as the driver of economic activity from bicycling; in contrast, they focus on shorter-distance trips made by residents (like commuting to work) to quantify the health benefits from cycling. They find nearly $1 billion economic benefit from recreational cycling in Wisconsin (drawing on expenditures on things like food and beverage, entertainment, lodging, and non-bicycle transportation). Additionally, they find a nearly $0.5 billion health benefit due to cycling (drawing on improvements in air quality, personal fitness, and greenhouse gas emissions). Combined, the study suggests the state of Wisconsin alone is experiencing close to a billion and a half dollar benefit from cycling. While the authors explicitly acknowledge the study’s shortcomings and potential inaccuracies (reliance on older data or data from other geographies), whether the number is $1.5 billion or $700 million doesn’t matter; the point is that there is a huge opportunity for benefits in economic activity and health from cycling. Enticing or inviting people to change their habits, especially to achieve the health benefits as reported in this study, is one of the biggest challenges for the coming year and decade. However, local policy changes do stand to make a big difference in the amount of bicycle tourism sought in a particular state – producing an influx of cash from another economy – in addition to benefits to residents’ as more bicycle-friendly policies increase their safety and security. Studies such as these are interesting and useful to policymakers; I expect to see more like it this year and in the near future. For more on what to expect from bicycling in 2011, see this nice summary piece from Grist. Cluster.eu, a great online and published magazine, gave me some challenging questions about our book "Connected Cities: Your 256 Billion Euro Dividend". Read it here - Connecting cities: an interview with Sascha Haselmayer. Lanzamiento del libro "Tu Dividendo de 256.516 Millones"
Living Labs Global se complace en invitarle a la presentación del libro "Tu Dividendo de 256.516 Millones", la edición en español y actualización de nuestro libro “Connected Cities: Your 256 Billion Euro Dividend” publicado por la Universidad de Barcelona. El libro cuenta con un nuevo epílogo realizado por el profesor Xavier Torrens, en el que posiciona el libro como una contribución fundamental en el actual debate sobre la política de la innovación local y urbana. Los autores presentarán el libro con motivo del INTA34 Congreso Mundial de Desarrollo Urbano, en Donostia-San Sebastián (España) durante la recepción de bienvenida del domingo, el próximo 24 de octubre, de 19:00-21:00 horas y en la primera sesión plenaria del miércoles, 27 de octubre. El libro ya está disponible y se puede adquirir a través de la página web de la Universidad de Barcelona o en las librerías de la Universidad de Barcelona. Este libro es un manual sobre innovación de servicios en ciudades dirigido al sector público y a directivos empresariales en el ámbito de servicios de innovación, especialmente para profesionales de pequeña y mediana empresa que desarrollan servicios de innovación y soluciones para ciudades. Movilidad no es una tecnología sino un cambio de paradigma. El usuario, tanto de ciudadano, como de profesional o visitante, se encuentra en un estado de movilidad representado por la ubiquidad de los teléfonos móviles en nuestra sociedad. ¿Porque, este libro se pregunta, no han tenido éxito servicios altamente apreciados como la gestión del aparcamiento a través de tu móvil, servicios turísticos o soluciones para la deficiencia visual, incluso a pesar de las inversiones astronómicas en infraestructuras digitales que se han hecho durante la última década? ¿Porque, no han alcanzado estas infraestructuras un impacto de productividad como el que tuvo internet en nuestras economías, cuando más del 60% de los ciudadanos del mundo tenían acceso a ellas? 256.516 millones de Euros es la suma de la oportunidad presentada en este libro, siguiendo casos de negocio reales y ejemplos de movilidad de servicios de innovación en ciudades. Dibujando desde el conocimiento y las experiencias de Living Labs Global, el libro ilustra lo que define el mercado para movilidad, abandonado por muchos por su propia complejidad. El libro estructura, de una manera lógica, las oportunidades del mercado, frustraciones y éxitos, y actores, en una llamada para la acción de cambiar fundamentalmente el modo en que prestamos los servicios en las ciudades. In our Handbook on innovation in services and mobility in cities, we published comparative data on the cost and impact of digital vs paper tourist maps. One of our conclusions is that digital mobility costs 1,011x more than paper maps. 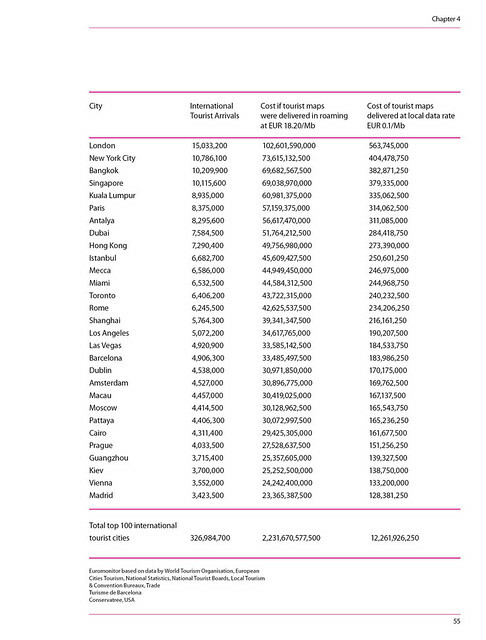 The updated table below, reflecting the latest available data on global tourism in cities (2008), shows the scale of the burden roaming poses on cities. Our data shows that, as an example, the 15 million international tourists visiting London in 2008 would have had to pay a total of EUR 102 billion in roaming charges to access the 22 million paper maps they collected that year. This is about 5x the total spending of tourists in London per year. Yet, the paper maps resource consumption constituted the equivalent of 19,000 trees - never mind the burden on dealing with the 1,600 hectares of discarded paper to the recycling systems. But these numbers are fictional, since no tourist coughs up the EUR 4,550 per visit that these numbers imply. instead, visitors chose to disable data services and roaming, pick up a free paper map (subsidized by the local tourist industry), continuing to make use of all its functions: scribbling, asking for directions, sharing & tearing, and tracing their route. All that at a cost of zero Euros. What then, has to change? In our book we argue that we need to fundamentally change the way we organise the cost of digital services in cities, eliminating roaming whilst adding significant commercial upsides to the operators to the tune of EUR 2 billion per year. Roaming is about 182x as costly as local data tariffs on prepaid plans, meaning that London could replace its paper maps for about EUR 560 million - or a mere 2.8% of tourist expenditure. 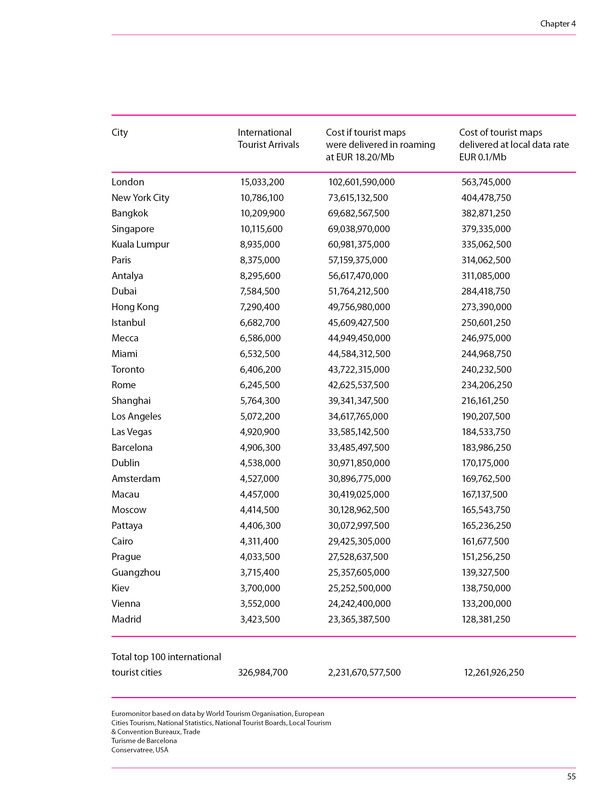 These numbers do not take into account the efficiency gains in bulk-costs and data consumption by reversing our business models, which would reduce costs to around 1.4% of spending and could make London (or any other city choosing to become the first to tackle this issue) the first roaming-free tourist destination in the world. Are We About To Witness A Digital Service Revolution? The launch of the book ”Connected Cities: Your 256 Billion Euro Dividend” this week in London by Living Labs Global in collaborationwith Design London, heralds how introducing new digital services in cities promises the change the way citzens live in cities around the world. Our Handbook on Innovation in Services and Mobility in Cities - "Connected Cities: Your 256 Billion Euro Dividend" - now out! We are pleased to announce that our new Handbook on Service Innovation in Cities is now out, published by the DesignLondon at the Royal College of Art. The result of a collaborative effort involving more than 20 contributors, the book presents rich original data and serves as a resource for professionals from both public and private sectors, as well as entrepreneurs, engaged in the complex yet potentially profitable market for service innovations in cities. You can flick through and order the book now at Amazon (UK), Amazon (US). Mobility is not a technology, but a paradigm shift. The user, as citizen, professional, or visitor is in a state of mobility represented by the ubiquity of mobile phones in our society. Why this book asks, have highly appreciated services like mobile parking, tourism services, or solutions for the visually impaired not taken off despite the astronomical investments into digital infrastructures in the past decade? Why, have these infrastructures not had the productivity impact that the internet had on our economies, when more than 60% of the world population have access to them? 256 Billion Euro is the sum of opportunity presented in this book, following real business cases and examples of mobility and service innovations in cities. Drawing on the rich insights of Living Labs Global, the book illustrates what defines the market for mobility, neglected by many for its complexity. It logically structures the market opportunities, frustrations and successes, and actors that make or break success into a coherent call for action to fundamentally change how we deliver services in cities. This book reveals important insights for public leaders, local politicians, service professionals in public and private organisations, entrepreneurs, technology experts, consultants and researchers interested in promoting innovation and excellence in cities today.